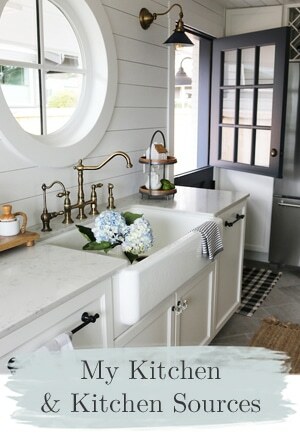 Loved this kitchen makeover from The Lettered Cottage! The bin things on the wall came from Home Goods, love that place! a beautiful and frugal idea from Nesting Place. This was a great spring makeover post from A la Mode! I like her twigs in the urn and that sweet ribbony flowery pillow! And from A la Mode I learned about the blog below. you can print and frame. 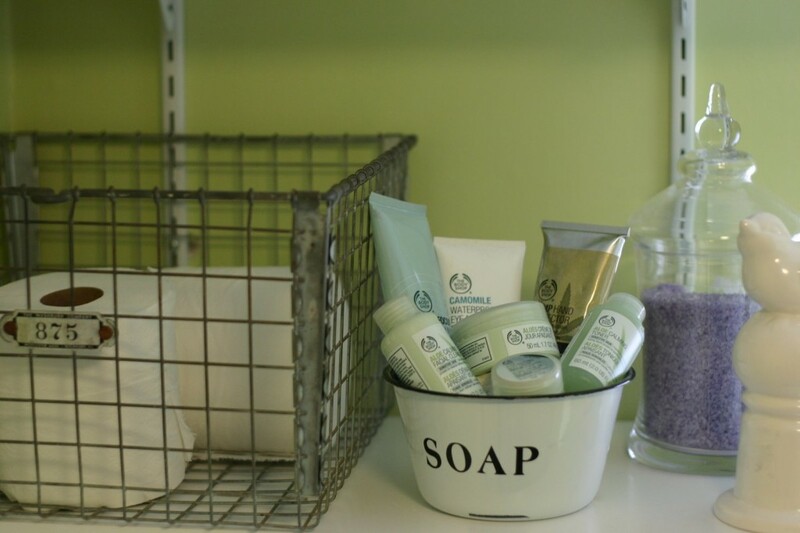 Creatively Dreaming shared a pretty spring bathroom makeover. Love the new colors and accessories! Find these and other AMAZING ideas on my Inspiring Finds Tumblr! Before we get on with our Beautiful Life links for the week, I want to personally invite you all to an exciting online women’s conference (I put a video on my blog, you can watch it and find a conference link here). I hope you’ll all consider coming to part of it or all of it! You don’t even have to dress up, you can wear your jammies if you want! the ordinary & the extraordinary? I think of you often through the week! I know these are tough times financially for so many of us. No better time to be looking for the beauty we CAN find! “10 ways to be happy at home”! and always link your post back to The Inspired Room! Random posts, posts linked to a home page, or posts with no links back will be deleted. You may re-link if you get your post fixed up. The participants this week have now been added permanently to this post! New entries for this week are closed, but visit each Friday for new editions of Beautiful Life Fridays! 30. Lorrie 31. Michelle @ Paper Glue Etc. Those are some very inspirational projects!! Happy Friday, Melissa! Thanks for always being a gracious hostess :) Good luck speaking! Very nice kitchen and accessories. Sometimes it’s harder to use restraint and keep things simple and interesting, which this one does. Susans inspiring blog post..Is a Kitchen Design Trend Always A Trend? I will check out the conference, I’m sure you will do a wonderful job, but blessings still the same. I know what it like to speak in public, always nerve wrecking. Have a wonderful weekend. and thanks for thinking about us. 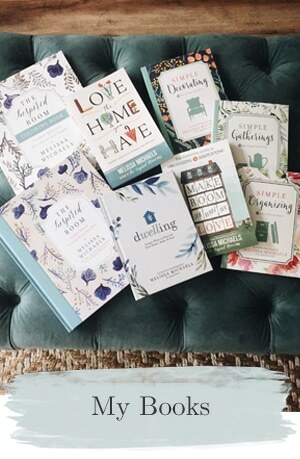 teresas inspiring blog post..Denver, The ugly white car… and It’s a Beautiful Life. Good luck with the conference Melissa, just because you’re not comfortable doing it, doesn’t mean that you’re not good at it! Thanks for another lovely week of inspiration. Beautiful links! I especially love the vintage print site, very cool! The herb/seed “things” on the wall are really unique. That video is great! I think I’m going to share it on my personal blog just for it’s message. Reaching others for Christ because we’re inspired… wow! Beautiful! I’ll pop over to the website later and see what the conference is all about. I hadn’t heard of The Vintage Moth before and just spent half an hour looking through all of the amazing pictures she has scanned. Love it! Also love Layla’s kitchen makeover, which is absolutely stunning. Nice of you to mention my post, too! Good luck at the conference. Remember – God doesn’t call the qualified. He qualifies the called. Home Goods is a great store! I could get lost in there for several hours. Great picture of the succulents. I want to reuse my hurricane globes for something more creative than a candle holder. I can’t wait to try it. 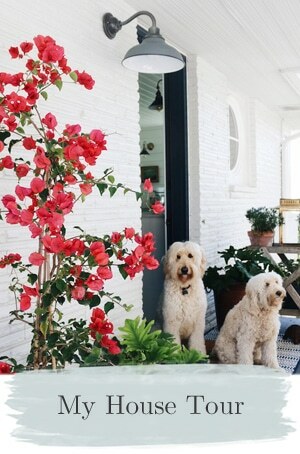 Lauras inspiring blog post..Bring the Spring indoors…even if it is still snowing. What cute ideas! Makes me wish I didn’t have top cupboards in my kitchen so I could have this instead! 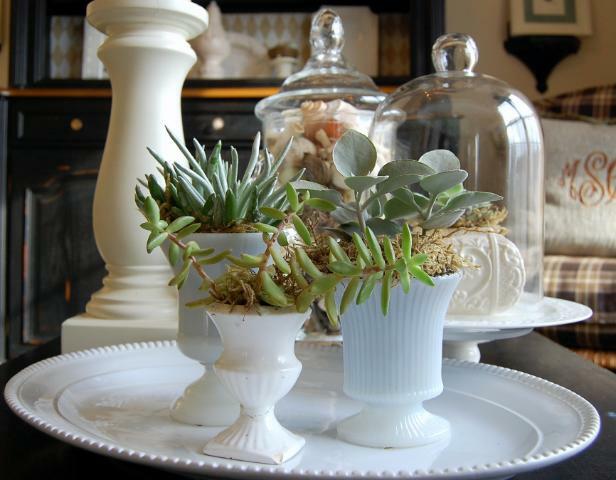 I, also, like the succulents in the white milk glass. And since I have many displayed in my dining room already I can incorporate this idea now! What creative ideas for unique wall arrangements! That first photo is wonderful. 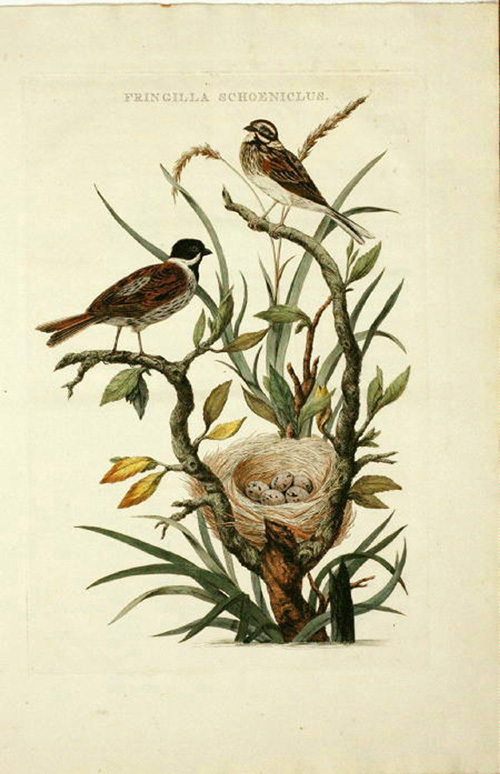 Yes, the Vintage Moth is a great resource, I use it often as is The Feathered Nest. Super quote and one that I need to employ often! Have a wonderful weekend, Melissa. Will I find you speaking if I follow the link? I’d love that! Off to find out. Vees inspiring blog post..What? No Chickadees? I’m so excited about the Vintage Moth!!! Thank you for sharing that link. 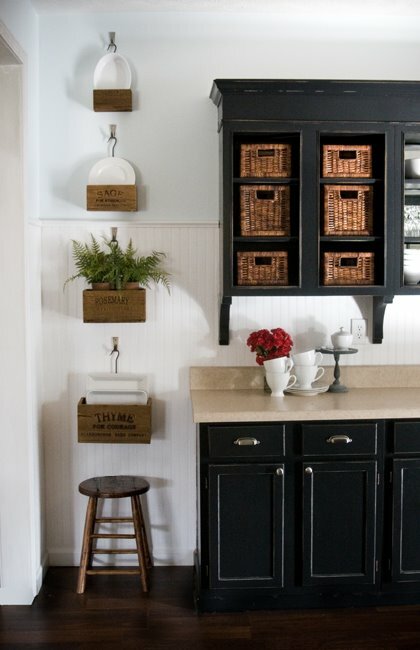 I love the black cabinet with baskets. I actually did a book shelf make over this week with a little black paint and some baskets at my house. For one of the boys’ rooms. Love the clean, simple and organized look. I love all your ideas. Thanks for the inspiration. I can’t wait to explore all the lovely links in your post today! I loved the idea of the boxes in the first photo! The conference sounds great, I’ll check it out. Thank you as always for hosting and for sharing beauty tips to make our homes and lives more pretty! I sure do look forward to Fridays now. I love finding new blogs and beautiful ideas. 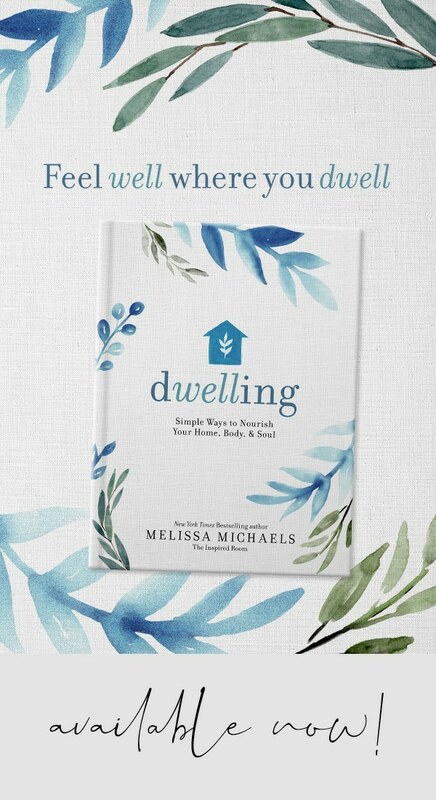 Thanks for always hosting this, Melissa. I’ve been reading your blog for a couple of weeks now and I LOVE it. Since you have your linky link thing up today I thought I would submit a collage I did earlier this week that was inspired by the beautiful weather we’re having down here. Thank you for the beautiful and inspiring links. I’m just learning to decorate for the seasons, so I’m trying to soak up as much information and inspiration as I can! This is a great place to start. I love the prints from Vintage Moth. I could spend A LOT of time there. I may need to go buy some frames. Spring fluffing is in the air! I love the fresh looks you’ve shown. I loved the kitchen makeover. Hi Melissa~ You are always such a fabulous hostess! The links are perfect for your series. I have been coveting Layla’s wall boxes all week… Can’t wait to hear more on your speaking engagement! 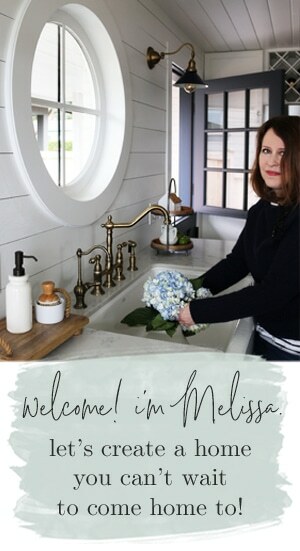 Misti of Studio M Designss inspiring blog post..My Surprise Revealed- Want to know what it is? Rich, useful, beautiful, inspiring. Thank you. Oh, for the love of making things prettier and more organized. LOVE ORGANIZED!!! You rock sister, the pics. you posted are lovely! Thank you so much for featuring my Kitchen! You are too kind! I don’t think I did that linky thing right. :-( Sorry if I messed it up! Lovely, inspiring things to look at here. hill upon hills inspiring blog post..Our Home Gallery. I’ll have to put your conference on my to-do list. I really enjoy visiting your blog. The re-dos are so inspiring. I love the kitchen pix. I have the old-school light colored wood, and I am trying to decide between painting them white or black. I linked to a post about doing an art project with my children. I get easily caught in the hustle and bustle of life and like to make beautiful moments with them…They are so inspiring. Love the fresh inspirations! Lovely details in your blog finds! It is a wonderful thing to celebrate the beauty in the world, and to make a beautiful life each and every day. Wasn’t it Emerson who said that ‘Beauty is God’s handwriting’? My post this week is about my favorite corner of beauty in this world. When I was taking Lamaze classes in preparation for the birth of my first child, the instructor told me to think of something that would make me happy and relaxed when I was in the peak of labor. I thought about the scene in the last picture on my post. 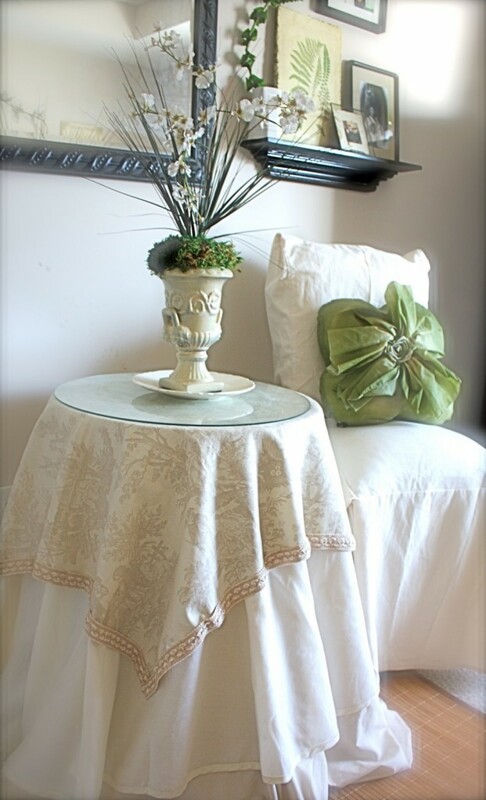 I just stopped in for a visit and saw a vignette from my bedroom on your blog. Thank you! And isn’t the Vintage Moth great? It’s a relatively easy and oh-so-yummy chocolate torte I just made. And it will change your life. 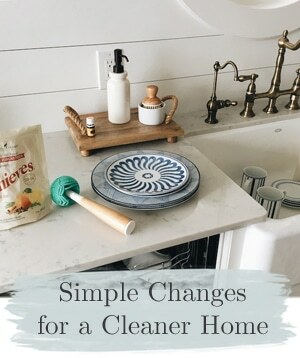 Donna at Extreme Home Renoss inspiring blog post..March update – upcoming changes! You have such a fun site! I love getting ideas here! This is the first time I’ve participated in your Friday event. I absolutely love reading everything you have to offer. I hope I did everything right. I like the design of the first kitchen. It’s a nice combination of modern and traditional. I don’t normally like dark wood, but it works there.